She cried and begged. Loudly. Urgently. But Jesus did not answer a word. Why wouldn’t He listen? Yet, she desperately held on to a fragile thread of hope. Who else but Jesus could save her daughter? The Canaanite woman’s daughter was suffering miserably and was cruelly possessed by a demon. 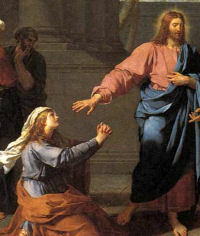 She pleaded with Jesus for mercy, but He just walked on. It seemed like He was ignoring her. The disciples had enough of her as they implored Jesus, “Send her away, for she keeps crying after us.” Yet she kept on begging, and kneeling, she worshiped Him. Wow! When I read this story, I marvel at the woman’s persistence. She had “confidence in what (she) hoped for and assurance about what (she) did not see.” (Hebrews 11:1) She believed in Jesus’ willingness and power to save. She trusted that even a crumb of His mercy could immediately heal her daughter. She did not give up until her prayer was answered. It may seem at times that God does not answer us, like He ignores our pleas and abandons us. But as He did with the Canaanite woman, He tests us. He knew before she cried, “Lord, help me!” that she would seek Him out and that He would save her daughter. But her faith needed to be strengthened. And so does ours. God doesn’t always choose to send immediate relief, but some day in His own timing and in His own way, He will.